Every hot Utah summer day you will find mothers and children arriving in droves at the splash pad. We moms are always looking for bargain entertainment and you can't beat free. Moms arrive with freshly packed lunches, ready to spend the day there while their children play. They rush at the opening hours to fight for spots in the shade. There are moms that visit with other moms, read or spend time on their phones, or even take a nap. There are moms who loosely watch their kids, yell out commands every once and a while, and enjoy a break. There are other moms, especially those of little kids, who walk in step with their little ones. There are moms who like to "mother" the other moms, telling them how they should or shouldn't let their kids play. Splash pad to splash pad, the patterns are the same. I envy all these moms. I spent the first few years of my first-born son's life wishing I could spend more time at the splash pad. 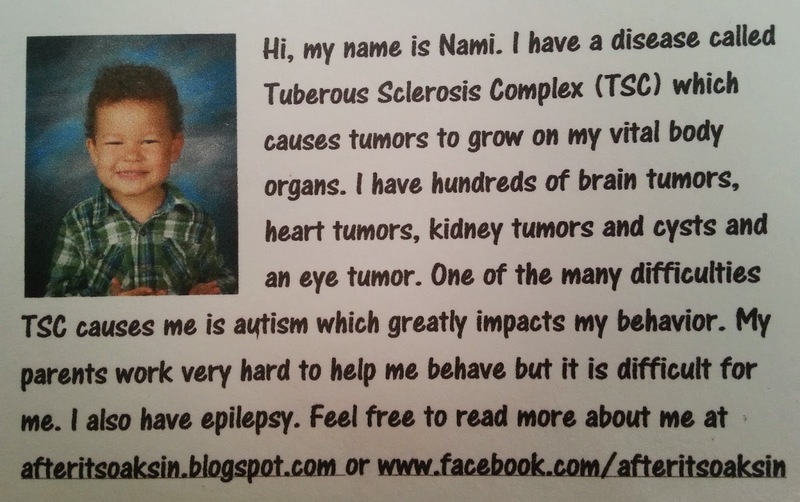 Instead, I spent my summers taking Nami to doctor appointments and in for constant testing. I spent my days watching him seize uncontrollably, sometimes up to 500 times per day. We spent hours in therapy in an effort to help his severe autism. I constantly rushed him to emergency rooms resulting in life flights, intubations, and multiple stays in the PICU. I spent an entire summer in New York for him to get a series of brain surgeries. 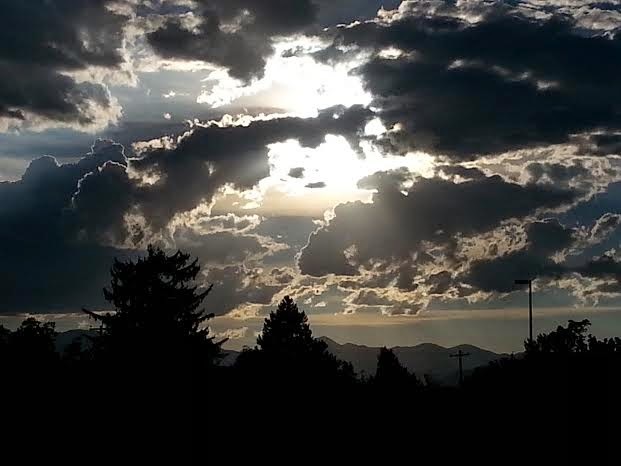 My summer nights were spent fearing for my son's life, watching him seize, tantrum, break things, and injure himself. My nights were sleepless as I cried and begged for this all to end. I suffered from severe depression, extreme anxiety, constant panic attacks and insomnia. My son has a condition called Tuberous Sclerosis Complex (TSC), a genetic condition that causes tumors to grow on all his vital body organs. He is regularly followed by at least 12 doctors who monitor these tumors. My son was 10 months post-brain surgery this past June when he had another surgery to implant a Vagal Nerve Stimulator (VNS). I was excited when he quickly recovered. His seizures were less severe, his outbursts less frequent, and his sleep (and therefore my sleep) more consistent. This was going to be MY summer. I was going to push aside my fears of taking my autistic son to play in public and we were going to the splash pad. The first time we went, I was the hovering mom, staying within a foot of my son at all times. The next time I was more relaxed, sitting at the edge and staying within a few feet of him. The next time I sat in the shade and enjoyed watching him as he experimented with different pieces of garbage he'd picked up to see how the water impacted their movement. I watched as he obsessed with the draining water. He did not interact with the other kids and none of them were interested in the things he was interested in. This was great for me because I actually felt relaxed and enjoyed a somewhat typical outing in a public place for once. The next time we went to the splash pad I took my kids and met my sister and her kids. 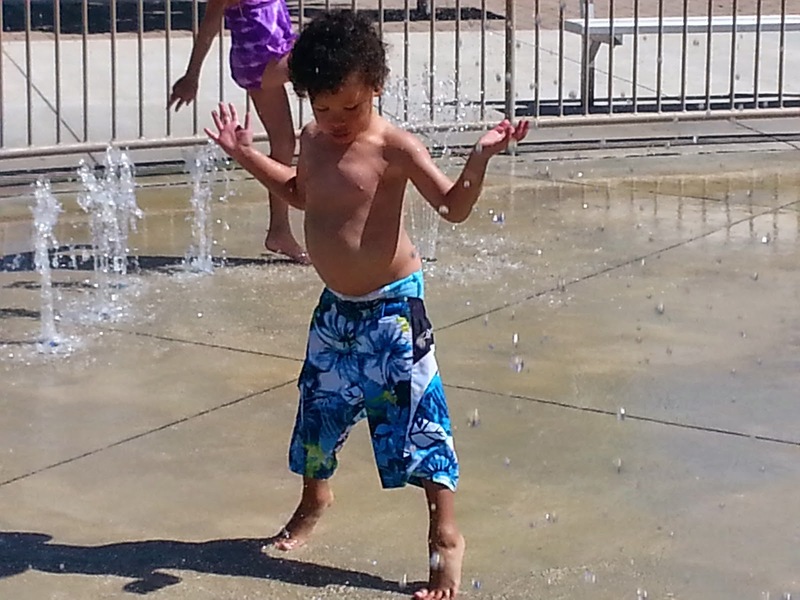 My younger son and my nieces and nephews ran around playing like all the other kids at the splash pad. My older son found his favorite spots, away from any of the other kids, and stimmed off the water. I chatted with my sister and mentioned how great it was to be able to do something "normal" and be able to actually relax a little. No more than 5 minutes later my sister yelled, "Oh No! Nami just pushed someone!" We both popped up and starting running the 20 feet to get to my son. My life went into slow motion as I saw the body-building father, of the young girl Nami pushed, yank him at the collar of his shirt, scream a couple inches away from his face and start violently shaking him. I watched as my son stared at the man, not knowing what to think. I witnessed the father get more enraged, shake my son harder, and scream at him as if he thought he was talking to a belligerent child who was refusing to respond to authority. Little did this man know that my son was nonverbal; that he feels threatened when someone comes into his space while he is stimming off something and that's why he pushed the man's daughter; how he had NO WAY to comprehend what was happening. I could not rescue my son quick enough. It felt like it took at least a minute to get to him as I helplessly watched his body being shaken like a rag-doll. In reality it probably took 20-30 seconds. My sister and I were both screaming at the man to stop but he was too determined to get an "appropriate" reaction out of my young child to pay any mind to our cries of desperation. My sister snatched my son from this man's grasp yelling, "STOP! He has special needs!" I uttered, "I'm sorry, my son doesn't understand" as I rushed after my sister. I started shaking uncontrollably as I tried to take my son out of his swimsuit and get us all to the car. I saw the man finally pick up his crying daughter and comfort her, then take her to the shade that his wife was sitting in about 15 feet from us. She quickly recovered and ran back to the water. I said, "I just want you to understand more about my son's condition. I'm sorry he pushed your daughter. I should have been closer to him...I usually am." He mumbled, "It's okay, she's fine". I walked back to gather my children and bags and left. By the time I arrived at the car I was shaking so badly and was in the beginning stages of a panic attack. My sister gave me a big hug and we each got into our cars to drive to our Mom's house. The second I got in the car I started sobbing uncontrollably. I was gasping for air which kept me from being able to hide my sobs from my 3 year old. He said, "Mommy, you're crying?" Through the tears, "I'm going to be fine." "You're sad because you got cold?" No longer able to hide my sobs, "Honey, I'm really okay. Thank you so much." "Just take a deep breath Mom. You're going to be okay. I love you." "I love you too. Thank you for helping Mommy feel better." By the time we arrived at my mom's house, I was LIVID. I couldn't believe I actually apologized to that monster! I couldn't believe I hadn't called the cops! I WAS ANGRY! If he thought that my son pushing his daughter was bad, try watching a grown adult physically attack your young child! How could he not see how terrible HIS actions were?! As I talked through the incident with my mom, I was so glad that I was able to react so calmly in the moment. It was an out-of-body experience. I felt that something had taken over my body and was doing and saying everything for me. I would like to think that I have learned love, patience and empathy from everything we've experienced over the past 5 years. The more likely answer is that God blessed me to get through this incident. My blood still boils when I think of it and there is no way I would have reacted so calmly in my own mind! I'm so grateful that I was guided to respond the way I did. I know that God helped me make a bigger impact on this man by remaining calm than making him defensive by lashing out in anger. I no longer think I have it in me to be a splash pad mom. Although this is from one of my favorite comedy sketches, I wish it was an accurate portrayal of how I truly felt about myself! Instead, my head is filled with Daily De-affirmations. In my teens to single adulthood I told myself things like, "I'm not smart; I'm stupid. My teacher is going to hate this project I just spent 16 hours doing. No one wants to be my friend. Even if that guy DID take me on a date, he'd regret it. I'm no fun; I'm boring. I don't have any unique talents. And, doggone it, I'm not pretty". Since beginning motherhood I've told myself things like, "I'm a terrible mother. I can't ask for help because people will feel put out. No one has the time anyway. I'm annoying. I must be surrounded by a force field that pushes people away. No one wants to be my friend. Why blog? I'm not a good writer. And, doggone it, I'm not pretty." Why the worry about being pretty? I dunno. I wish I never thought about it. A constant voice inside by head screams, "YOU ARE UNWORTHY OF BEING LOVED!" No amount of nice remarks, loving gestures, encouragement, etc. helps change the way I feel. I somehow find a way to make anything that goes wrong my fault, or explain that they happen because of my shortcomings or flaws. I realize this is a ME problem. No one else can change this self-damaging thought process for me. It's something I've got to fix. Over the past few years I've become increasingly aware of how much these harmful thoughts have shaped me. How much this voice has been my constant companion. How much it makes me NOT LIKE ME. In order to change this, I needed to comprehend the severity of my negative self-talk. Truthfully, I wasn't really aware of it being there since it's been my constant companion for most of my life. By the time I started to see a therapist, for the first time in February of last year, I was vaguely aware of my problem, but became more open to seeing it's reality. I had a rude, yet necessary, awakening while in New York in the summer of last year for Nami's brain surgeries. One night I was in my hotel room with my sister and we were having a really great talk about life. During this talk my sister painted a different, yet more accurate picture of how a guy I really liked in my dating days had treated me. While I thought he was so great, she explained that he actually hadn't been very nice to me at all. I countered her assessment, "He was nice. He did a lot of cute things." My sister explained, "Annaka, he would tell you that he liked you but wouldn't tell anyone else. He wouldn't invite you to do things with his friends. He kept the relationship hidden. It's just interesting to me that you liked someone so much that didn't treat you very well. I knew you deserved better but you couldn't see it." I was stunned. I sat there thinking, "Could this be...that I actually convinced myself that it was cute that this guy secretly did all his 'nice' things for me? How was I able to twist that so far in my head? How could I have been so naive to think he had actually liked me?" ...how I put myself down as a form of self-protection. I saw these patterns in multiple experiences, relationships, and situations throughout my life. I began questioning all my relationships up to this point. I became painfully aware of my trust issues (another blog for another day ;). On the other hand, I also recognized I was blessed with some very loyal and loving friends. Becoming more self-aware is not a comfortable process for me. As I try to make these necessary changes, I wonder how long it will take to train my brain to have consistently healthy thoughts. How I will be able to recognize that I actually do have talents. And how I can change my actions so that I am able stand up for myself when needed, all the while trying to maintain the pieces of who I feel I really am. I started my blog a couple years ago and of course belittled my writing in my profile. (Maybe I should go change that.) I have put a lot of effort into my writing over the past few years, and even though I discount that it may be quality writing, I have hoped to eventually publish some of it. My constant negative self-talk has kept me from putting myself out there. I recently had an experience that stretched me in uncomfortable ways. Last month, I saw a fellow blogger post something that was very similar to a blog I posted (and had been read by this blogger) many months prior. I read it, was annoyed, but talked myself out of doing anything about it. Within a couple days, that blogger's post was published on a reputable site. I felt sad that someone would take my idea and pose it as their own. Especially because I feel so vulnerable blogging and it's still scary for me. I wanted to give up blogging altogether. I didn't want to be a part of something that left me susceptible to being hurt and taken advantage of. As I pondered over the situation, I decided that instead of falling into my typical self-doubt, I should be flattered. It should make me feel good about my writing because it may mean that some of my work might actually be worthy of publication despite all the reasons I come up with to talk myself out of it. (I'm still not okay with anyone using any part of my copyrighted posts without my permission). I am slowly starting to see evidence of improvement in the things I tell myself. Although it's still difficult for me to think and say good things about myself, I can finally admit to finding one good thing I'm good at; my job. There, I said it out loud! One day I hope to be able to proclaim, "I'm smart enough, I'm good enough, and doggone it, people like me."